Fall is officially here! Time for pumpkin patches, apple orchards, Sunday football, and so much more! Say hello to this season by adding a few cozy autumnal touches to your home. Here are a few quick ideas to get you inspired! TABLE DISPLAY – Swap out your summer centerpiece for a fun fall display. 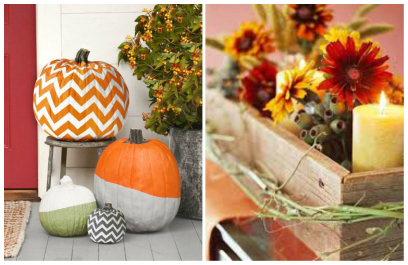 Incorporate leaves, pumpkins, hydrageas, corn husks, and any other fall accents to create a beautiful masterpiece. You can even use move the display to your fireplace or foyer table if necessary. Think outside the pumpkin by painting it instead of carving it. Re-pot those brightly colored mums into a hollowed out pumpkin. Create a “Happy Fall” wreath for the front door with fallen leaves, corn husks, or wood pieces. Create other accent décor with pumpkins, wooden signs, and more! FIREPLACE – Your fireplace is a great central area to decorate for fall. Freshen up your usual accents with autumnal items like acorns, twine, dried branches, candles, leaves or wood pieces. Paired with candles, small pumpkins/gourds, and frames or signs, these items will give your home the perfect accessories for this season. Once completed, turn on your fireplace, grab a blanket and warm coffee, and cozy up on the couch with a good book! OTHER ACCENTS – An easy way to bring in fall colors is with the ideas we’ve listed above, but another popular way to bring in those beautiful hues is to swap out your throw pillows. Opt for patterns like plaid and stripes or deep tones to bring warmth into your home. Some of the most popular fall accents include burnt orange and wicker pieces. As you start brainstorming ideas for your own home, think long term. Your fall décor can be used through Thanksgiving – no need to worry about updating your decor for your holiday with the family! For more fall inspiration, check out our PINTEREST board.